Pete Buttigieg, the Democratic mayor of South Bend, Indiana, who’s exploring a presidential run in 2020, is already a Da Vinci–esque multihyphenate: He’s a military guy, a Midwest guy and a management guy; he’s multilingual and a millennial; he’s a Harvard-educated Rhodes Scholar; he’s a talented writer — and, oh yeah, he’s gay. But it was a recent addition to that list that sent a thunderbolt through a certain corner of the internet. Mayor Pete, apparently, is also a Phish fan. Phans are known for diehard enthusiasm. Some go to dozens, even hundreds of shows. Phish fandom has its own vocabulary, forums, subcultures, podcasts, charities and more. Phans are not a monolith — but many are tight-knit, tech-savvy and influential enough in media and politics (like MSNBC anchor Katy Tur) to spearhead an effective grassroots campaign. We reached out to as many fans as we could to talk about Buttigieg’s chances in 2020. So What Does Buttigieg’s Phish Tweet Mean to You? Chris Gelbuda, songwriter, Nashville; 200+ Phish shows: When I heard Pete was a Phish fan, I was pleased. Chris Arwady, Chicago: I’m definitely pumped about Mayor Pete being a Phan. I feel like listening to Phish gives you a much better grasp of what it means to be collaborative, because you’re sharing in the groove. That’s so important for politics. Jordan Hoffman, film critic and entertainment reporter, NYC; 35+ Phish shows: My two passions in life are Phish and Star Trek. So I thought Stacey Abrams had my vote locked down until I saw Buttigieg’s tweet! I just hope they run on the same ticket! As for who should be the Trey/Kirk and who should be the Mike/Spock? Don’t make me choose! User ttt24x on Reddit: Best national rollout for a dark-horse presidential candidate in modern history. I don’t care what party you are in, this guy is playing the game right. What Do We Think of Buttigieg as a Politician? Adam Scheinberg, Mockingbird Foundation president and key figure behind Phish.net: Pete — a gay veteran Midwest up-and-comer, hip to improvisational rock performed by supremely talented musicians — represents an unexpected mix of what many people love: an uncategorizable, unique tapestry, much like Phish. User Whats_The_Use on Reddit: If [Buttigieg] demonstrates campaign, fundraising and debate chops, he also provides some much needed small-town-Midwest charm that a Harris, Warren or Gillibrand will find appealing [as a candidate for vice president]. I am most excited at the prospect of seeing him in a one-on-one debate with Pence. Both being Hoosiers, but Pence will shrivel at being confronted by an openly gay veteran Rhodes Scholar who wins rural districts by 80 percent. Josh Sternberg, AdWeek editor, NYC: I have to imagine that, like many other groups, there are some who feel one thing and others who feel another. I wouldn’t be so prescriptive as to blanket a whole entire fanbase. Scheinberg: It’s possible that Mayor Buttigieg and Phish won’t appeal to everyone, but each is both intriguing and impressive enough that, for many folks, the combination’s a winner and there will continue to be a virtually never-ending supply of passionate fans. Gelbuda: Liking Phish isn’t enough. I’m hoping [Buttigieg] wants to build a wall… to keep out the wooks and the chads. They’re killing us folks! Sad! User CatFacedBoy on Reddit: He also played piano with Ben Folds at a South Bend show. That’s way cooler than Bill Clinton playing saxophone or Donald Trump sort of knowing how to clap. Will the Phish Fandom Mobilize Behind Mayor Pete? Sternberg: Phish fans were early to the web, especially forums. I think they punch way above their weight. They’re definitely a passionate bunch, which could translate well to a grassroots movement. Hoffman: Some [fans] could give you a long lecture about the #lore of Gamehendge, the setting of a tongue-in-cheek high-fantasy song cycle called “The Man Who Stepped Into Yesterday,” and others could explain, musically, just what is happening with the chord changes during the segue into a Type II jam on “Mike’s Song” on 8/4/15 in Nashville. (I myself can only tell you that it ruuuuuuuuuuuuules.) There are others who go to the shows, boogie, laugh, high-five strangers and spaz out while staring at the lights — and it’s their first time! It’s all good. Sternberg: But I’m not sure there are enough Phish fans to push Pete to office alone. Hoffman: Phish fandom is, by and large, friendly and entertaining and warm… [but] sadly, no, I don’t think the plugged-in, web-savvy fans are enough to turn the dial for Pete alone. There is a lot of Phish prejudice out there. People think they hate Phish even though they’ve never heard them. Of course, Phish is so eclectic and has so many contours to their music/show that there is no possible way to hate ALL of it, unless you just hate sound. Sternberg: I don’t think any one politician can fix our political mishegas. While having a Phish connection would be interesting discussion, [Buttigieg’s] political philosophy and his professional experience in the military and in office weigh heavier in terms of perception. Sternberg: I’d like to think Obama and his Choom Gang would’ve been turned on to Phish at some point. At the very least, Bernie Sanders has — as he was mayor of Burlington (where Phish is from) when [the band] started. Hoffman: Phish (as was the Grateful Dead before them) is more apolitical than you think. Jesse Jarnow writes about this in his outstanding history Heads: A Biography of Psychedelic America. They’ve been very selective in the causes they’ve endorsed, sticking mostly with a local Vermont ecological group. Lately, that has changed a bit, as [Phish] drummer Jon Fishman (did you know Phish has a guy named Fishman in it!?!?!?) has gotten involved in local politics and is actually on a council in the little town in Maine where he lives when he isn’t touring. Of course, Phish’s home base is forever Burlington, Vermont (even if Trey is a New Yorker now), and with that comes a connection to one Bernard Sanders. 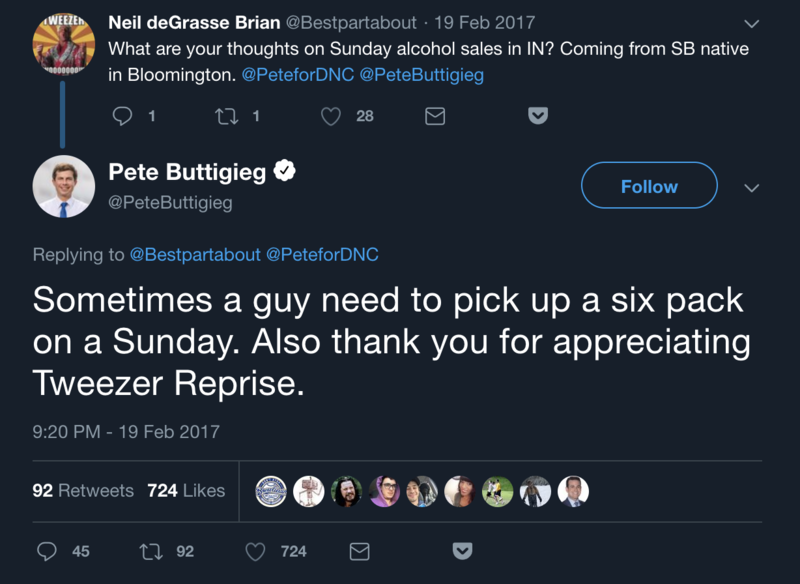 What Would President Buttigieg Do? Arwady: I’ll tell you what, I’d like to spark one up with Mayor Pete and talk to him about an issue that concerns all of us on this squirming coil: the longstanding theft of donut holes in this country. Think about it, man: Every time you eat a donut, you’re letting Big Donut take 10 percent of the donut from you and then resell it to the next guy. It’s simple economics. Why are we letting the donut manufacturers rip off the American public like this? You know [Buttigieg is] going to be sitting across from Mitch McConnell one day, and Mitch is gonna be like, “Bro, you can’t change the national anthem to ‘Gotta Jibboo,'” which is that super-rad tune from Farmhouse. Mayor Pete knows that he’s gotta keep it loose and funky with Mitch, and so he says, “Okay, let’s compromise,” and Mitch says okay, and now our national anthem is “Mexican Cousin,” which is about drinking tequila, and what could be more American than that? Hoffman: I think anyone who has the patience to listen to one of Phish’s signature 19-minute jams is going to be able to work with a divided Congress and make progress. We should all vote for Phish fans.